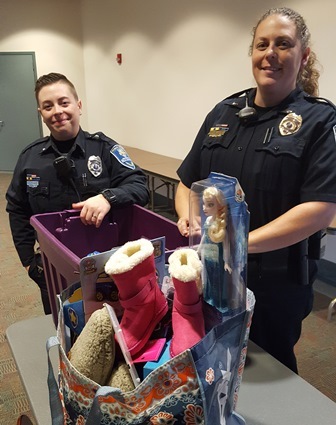 Officer Tiffany Street (left) and Lt. Keri Stein help launch the Department of Public Safety’s Willow Center holiday donation program. The Department of Public Safety is again collecting items throughout November to help survivors of domestic violence and their families in the Rochester area. This is the second year that Public Safety is participating in the Willow Domestic Violence Center’s annual Purple Box campaign to collect new holiday gifts for over 300 children in crisis. The Willow Center’s Purple Box campaign launches this time each year in recognition of national Domestic Violence Awareness Month. Public Safety officers represented the University at an Oct. 24 campaign announcement, joining law enforcement leaders from Rochester area police departments. Willow Center families have survived trauma, violence, abuse, and relocation and are just beginning their journey to a safe and empowered life. The children in the shelter are away from everything familiar to them–their home, their toys, their friends. A kind gesture of providing new toys can give a child in crisis a sense of normalcy and hope. Members of the University community can participate by donating new items to the purple boxes on campus now through Dec. 1. The purple boxes are located in the Public Safety Office at 612 Wilson Blvd. ; the Public Safety Crime Prevention Office in Strong Memorial Hospital, located on G-6009; and—from Nov.15 through Dec. 1—at Wilson Commons Connections Office (Room 202), located on the first floor of Wilson Commons. The Willow Center’s Holiday Wish List outlines the type of donations accepted and most needed. For more information about the Department of Public Safety’s participation in the Purple Box campaign, contact Investigator Lorri Strem at 275-7410; Lt. Keri Stein at 276-4736, Officer Tiffany Street at 275-3333, or for Strong Memorial Hospital, Captain Cindy Coates at 273-5022.